Ferrari is best known for its two-seater, two-wheel drive supercars which have sustained it over the decades and earned it plenty of passionate fans. However, in 2011 the Italian manufacturer decided to turn convention on its head and release the Ferrari FF. The title points to the fact that this is not only a supercar grand tourer with four seats rather than two but also a Ferrari with four-wheel drive. No other production car from this firm has ever featured the same setup, which makes it something of a novelty. So, if you’re looking or an upmarket supercar with four seats and four-wheel-drive, take a look at the range of used Ferrari FFs for sale at RAC Cars. The Ferrari FF tucks a 6.3 litre V12 engine beneath its bonnet, giving it a 651bhp peak output when the revs get up to 8000. Like other modern Ferraris, this comes with a seven-speed gearbox and a double clutch mechanism that echoes those found in Formula 1 racers, allowing it to shift quicker and cleaner than any manual out there. The surprising practicality of the FF’s design really stands out when you get inside. The two seats in the rear are actually large enough to accommodate adults. Ferrari has even worked in flexible seating, which means you can fold down the rear seats to expand the boot’s 450 litre capacity up to 800 litres. Standard kit includes carbon ceramic brakes, a stellar stereo system and alloy wheels which are specifically designed to be as light as possible. Ferrari hasn't just slapped on a 4WD system to one of its more standard designs for the FF. Instead, it has worked hard to dramatically reduce the weight of the setup required to deliver power to all four tyres, resulting in a car that feels phenomenally fast and is also better equipped to make use of the power available to it. Explore the range of used Ferrari FFs from our collection to find the right model for you. 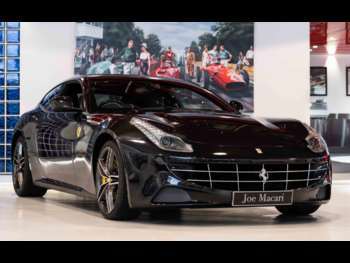 Got a specific Ferrari FF model in mind?